Attendees at Australian designer Josh Goot's most recent presentation may have thought they stumbled into a strange museum installation, so dizzying were the candy-stripe colors, patterns and digital prints glinting from the runway. Though Goot has been creating his progressive, pseudo-futuristic collections since 2005, he's only recently made a splash on US shores, hailed as "one to watch" in 2011 by Jak & JIl's Tommy Ton. We spoke with the designer to hear how he developed his splashy spring palette, and why he thinks 2011 has been his most successful year yet. You've been hailed as a newcomer in the states, but you've been designing since 2005. Why do you think your latest collection has gotten so much attention? I think the latest collection is our best work to date. It is also very true to the label. I think this honesty resonates with people. Also, sometimes the timing is right ... I’m glad that people have noticed the work. Tell us a little about the prints used in your most recent collection. The print story is inspired by the work of Gerhard Richter. In particular, his Overpainted Photographs. We wanted to do something graphic, using negative space. Something that felt free, but also controlled. 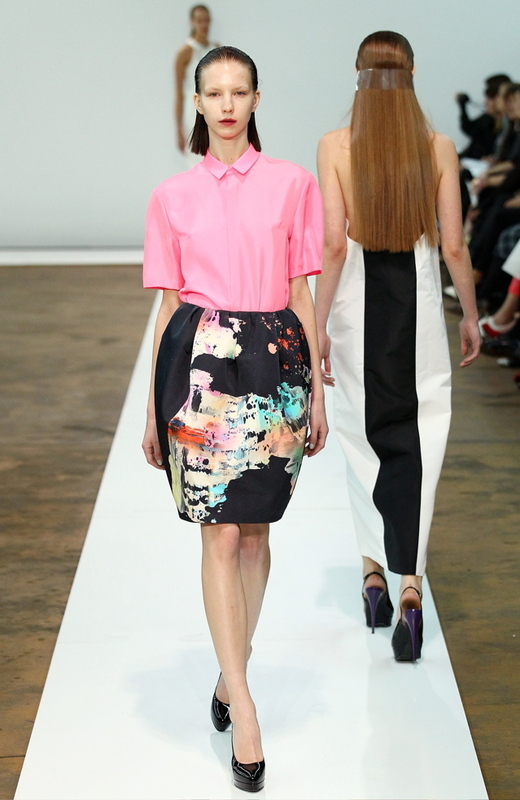 Do you consider Josh Goot a "print-driven" brand? Print is an important element of the collection at the moment, but I don’t see us a print-driven brand. I think we will reduce our print statement in the coming seasons. You seem to have almost a painterly sense of color and pattern. Do you come from a fine arts background? Actually, I come from a media and communications background ... That’s if you count one year at university as a "background." We were so sad to have missed your Target "Go International" collaboration in Australia. Have you given any thought to doing your own diffusion line? It’s something that I’ve thought about, but at the moment, I really want to focus on the main line. Any hints about what we can look forward to in Fall 2012? I’m just starting to work on this collection now ... It’s taking shape with heavy wools and new shapes, a shirting story, some high tech / performance ideas, rich colours in beautiful wool / silk blends for winter. What's on your reading list this season? I would like to read The Finkler Question by Howard Jacobson. I’ve been listening to Pantha Du Prince.